With a heavy heart I report that Jerry Evans, a beloved member of the Rocky Mountain Spiritual Fellowship graduated this morning at 9:30 AM. You will recall that he had a stroke earlier this summer. He was 85. Jerry is the husband of Joan Biek Evans and the stepfather of Christilyn Biek Larson and David Biek. He and Joan were married for close to 15 years. 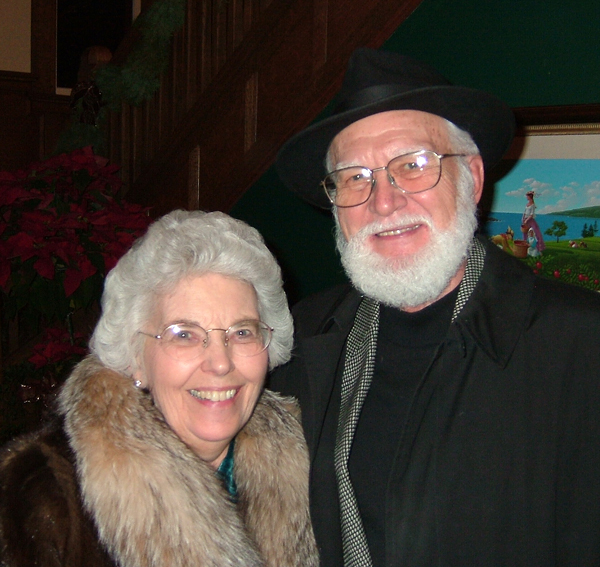 Maria Downing Tamm introduced him to the book when she was a hospice nurse for his first wife, whom he tenderly cared for through a prolonged illness in the 1990's. Shortly before her death he began to read the book. Later he started coming to our Boulder study group where he met Joan. Joan had been living the single life for about 20 years and you should have seen the sparkle in her eye when this prince of man walked into her life. Needless to say, it was a great honor for me to be asked to officiate at their wedding. I say Jerry was a prince because he was a true gentleman and a Jesusonian. In all the years I knew him I never once saw him be anything but gracious, kind, thoughtful and loving. All of us who knew him loved him dearly and he will be sorely missed by the entire Urantia family in Boulder. In addition to the adoration he received from multiple generations of the Biek family, he also leaves behind a daughter, son and grandchildren. Farewell dear and faithful friend Jerry. You are as tall as a tree, as strong as a rock and as gentle as a mountain breeze. We sure will miss you!